Earlier this year, McMinnville was recognized as a Tree City USA community for the 22nd consecutive year! 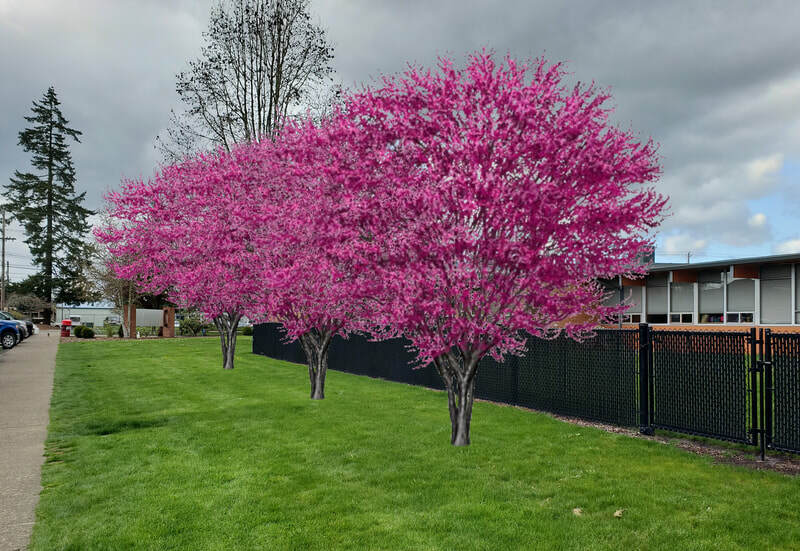 With the help of McMinnville High School students and a grant from Oregon Community Trees, McMinnville’s status as a Tree City USA community will continue to blossom through 2019. The City of McMinnville will hold an Oregon Arbor Week and Arbor Day celebration, Saturday, April 13, 2019 from 9:00am-11:00am. Oregon Arbor Week, which is April 7th – 13th, is a chance to celebrate trees and recognize all of the benefits that they provide to our state, city and local community. National Arbor Day is April 26, 2019, and will be celebrated nation-wide in communities of all shapes and sizes. 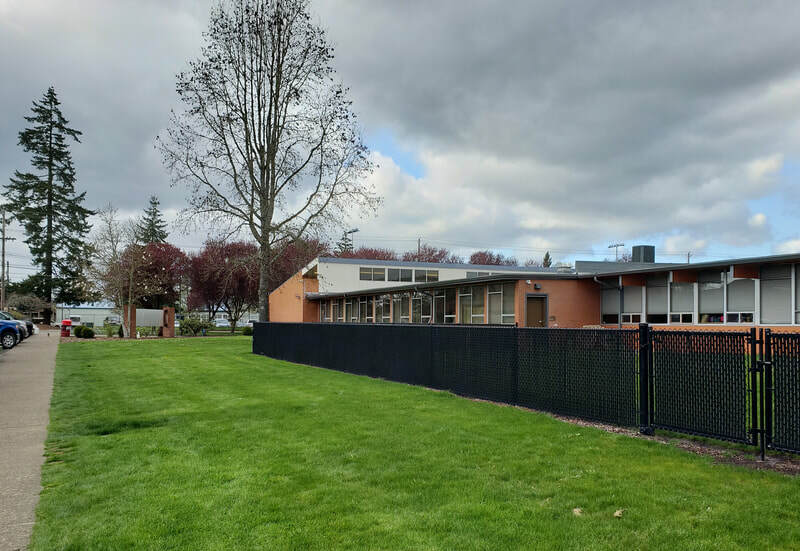 Jamie Fleckenstein, Associate Planner and a licensed landscape architect, who is the planting project coordinator for McMinnville, says he’s excited to gather the community to join in planting three trees at McMinnville High School. The trees will replace two hazardous trees that were recently removed from the campus. The new trees will be a species that will be more appropriate for the area, grow to provide shady relief to the Bear Hugs preschool playground, and add to McMinnville’s community forest. Oregon Community Trees has awarded a grant to the City of McMinnville to help support the tree planting event. Other students will be engaged in the planting project - McMinnville High School students who are studying within the Natural Resources track will assist with the tree planting. Grants Committee Chair Morgan Holen said Oregon Community Trees promotes healthy urban and community forests. “We assist community groups, local governments and schools throughout the state with expertise and grants that support leadership, education, awareness and advocacy for urban and community forestry,” Holen said. This year eight cities in Oregon are receiving a combined total of $4,000 in grants from Oregon Community Trees. One criteria for receiving an Arbor Week grant is being a Tree City USA, a status McMinnville has held for 22 years. For more information about Tree City USA, you can visit their website here. For more information about the Arbor Day Tree Planting event, contact Jamie Fleckenstein at (503) 474-4153 or jamie.fleckenstein@mcminnvilleoregon.gov. Oregon is a place with great natural beauty. From the mountains to the coast, and the forests down to the Willamette Valley, there are so many areas with beautiful scenic views. Here in McMinnville, we are lucky enough to live in a place where you can drive around and see some of these great natural features. The rooftop bar at Hotel Oregon probably provides some of the best views in town, but there are also other scenic views from places easily accessible to everyone. While I definitely enjoy the places in and around town where you can view Mt. Hood’s iconic peak, I also appreciate the more simple views of the hills surrounding our town. When walking along the Westside Greenway trail – which runs from Baker Creek Road to West 2nd Street – the views to the foothills west of town always provide a peaceful and interesting backdrop. I always enjoy seeing the snow in the hilltops from the lookout at the top of Wallace Road on a morning run, or just simply watching the clouds and fog settle in the valleys when I’m walking my dogs along the trail. As we design our neighborhoods, is it important to preserve some of these scenic views so that they are accessible for everyone? I am lucky enough to live in a McMinnville neighborhood with a great recreational facility – the Westside Greenway. This greenway runs from Baker Creek Road in the north down to West 2nd Street on the south. The greenway includes a wide, paved trail for walking and biking, and also includes landscaping along the perimeters and open grass areas where kids can run around or play a pick-up game of football. A soft, wood chipped trail climbs up a steep portion of the trail near Wallace Road, which is an interesting change of pace along the trail. Benches are provided throughout the greenway, providing a place for people to sit and rest or talk with a friend. The greenway even includes a boardwalk that crosses a drainage way and wetland area near Meadows Drive. The Westside Greenway is such a great amenity for all of the reasons above, but also for the additional benefits it provides. We use the trail to walk our dogs and go on runs for exercise. The trail is one of the areas where we most often see our neighbors and stop to talk with them (and let the dogs sniff and play with their furry friends). The portion of the greenway with the boardwalk over the wetland area provides a little connection to nature, where you often see deer and other wildlife walking through the wooded area. The benches and lookout area at the top of the hill near Wallace Road provide a view out towards the foothills west of town. All of these benefits and opportunities that the Westside Greenway provide help to improve the quality of life in my neighborhood. There is so much research into the health and social benefits of open space and green space, and a good compilation of some of that research is provided by the University of Washington’s College of the Environment. They provide a website titled “Green Cities: Good Health” that compiles research on the active lifestyle, mental health, and social benefits that access to open and recreational spaces can provide. Do you think it is important for every Great Neighborhood to have access to open and recreational spaces? Home Away from Home: Do You Have a "Third Place"? Local gathering places provide an opportunity for social interaction and community building. These places can take many forms – a local park, a small neighborhood market, a salon, a gym, a coffee shop – anywhere that people can go to meet their daily needs while also interacting with their neighbors and community members. These places are often referred to as “third places” – places where people spend time between home (first place) and work (second place). 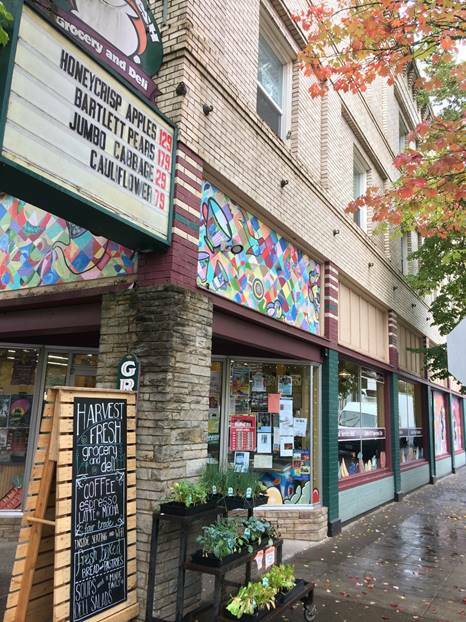 A local example here in McMinnville is Harvest Fresh. This small grocery store not only provides access to quality foods, but also provides an opportunity for community building. When you walk into this small corner grocery store, your attention is immediately grabbed by the line of patrons waiting to enjoy the daily soup special or some other delicious option from the deli. There are seating areas inside and out that provide a place for neighbors and friends to meet for lunch. The front door and the board at the back register provide opportunities for posting flyers about community news and events. Even as you approach, Harvest Fresh is a place that grabs your attention as it oozes uniqueness, from its colorful murals adorning the facade to the handwritten daily specials on a pop-up chalkboard outside. All of these things help make Harvest Fresh a “third place” and a great neighborhood gathering place. Is it important that every neighborhood have an opportunity for a local gathering place? Should access to amenities like Harvest Fresh be a Great Neighborhood Principle? When you think about a neighborhood that you really like, does any particular feature come to mind? Oftentimes, neighborhoods have unique and integrated design features that stand out and make the neighborhood more memorable. These types of design features can also help to create a sense of character in a neighborhood or place. These integrated design features could come in many forms. Many residential subdivisions have monument signs at the entrance, creating a gateway into the neighborhood and setting a specific style that might be repeated throughout the neighborhood. Maybe there are decorative street lights or signs that are unique to one particular place. Banners could be mounted on street lights throughout a more commercial neighborhood center. 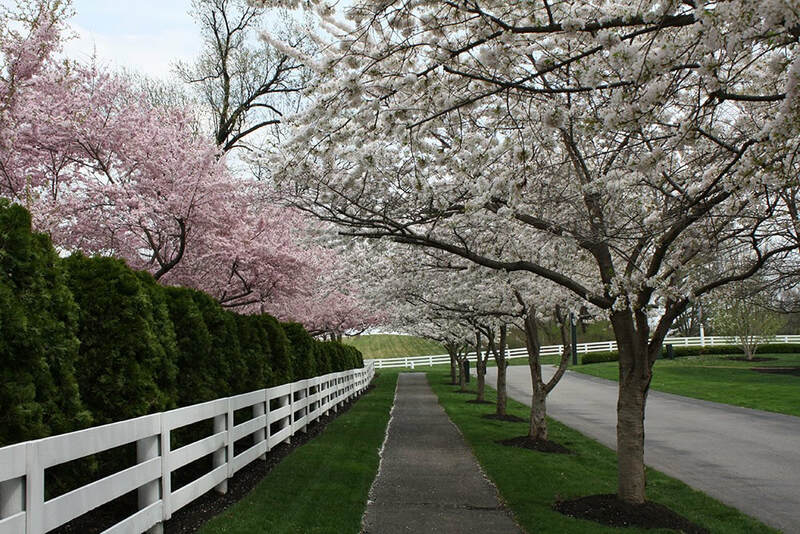 Fence designs and landscaping could be consistent along streets. Neighborhood names or themes can help in defining a neighborhood. We have some local examples of neighborhood names that tie back to this historic owners of the land, such as Chegwyn Village. We also have some others that may not be as well known – Newby’s First Addition (a subdivision of property completed by William T. Newby – an early settler of McMinnville) or McMinnville College Addition (the name of the local college before it was changed to Linfield College in 1922). The Oak Ridge neighborhood includes a theme, with each street named after a wine grape variety – Pinot Noir Drive, Riesling Way, Zinfandel Court – a link to the wine industry in McMinnville. Do you think that specialized design features make a neighborhood great? Do you think that these things help to create a sense of character in a neighborhood? A common concept in city planning is that interconnected streets promote inclusion and increase the likelihood of social interaction between neighbors. An interconnected street network, also often referred to as a grid street network, also increases safety and accessibility. The graphic below shows two different street networks. The street network on the top half of the graphic is based on a grid system and is interconnected. 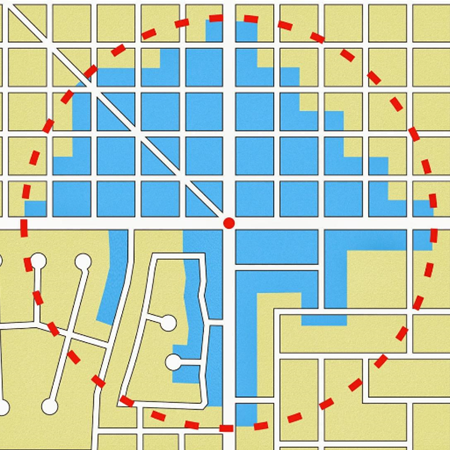 The street network on the bottom half of the graphic is disconnected, with cul-de-sacs and streets that do not connect through to adjacent streets. The area shown in blue is the area that is accessible within a certain amount of time (say 10 minutes) from the red dot in the center. As you can see, there is much more blue area in the interconnected street network. Think of this street interconnected-ness in another way. If your child’s friend lives one street over, but that street is not directly connected to your street, it could take much longer for your child to walk to their friend’s house, even though the houses and streets are very close together. This would mean that your child has to walk further to visit, perhaps even having to walk out to a larger, busier street to get to their friend’s house. In this way, your neighborhood’s design and street network could start to influence your behavior and sense of safety – if it is further and less safe to walk, maybe you don’t feel comfortable letting your child walk to their friend’s house. 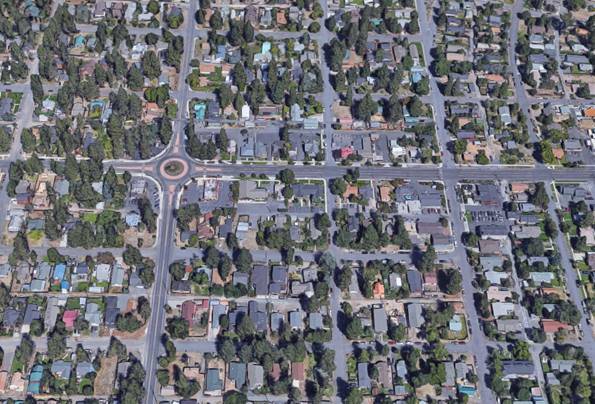 Should we strive for interconnected streets in our neighborhoods? When street connections aren’t possible (due to topography or other natural features), should there still be pedestrian connections between streets? Providing a variety of housing options within a neighborhood can provide opportunities for different types of households and families to live in great places, and it can also provide more desirable living arrangements for larger or extended families living together in one place. This concept is often referred to as multi-generational housing – grandparents, parents, and children all living together in one home – and it is becoming more and more popular. Examples of this type of living arrangement could be aging parents moving back in with their grown children to be closer to their support systems. Another example could be young adults moving back in with their parents, perhaps while they save up for their own home. This Forbes piece on multi-generational housing describes the shift in living arrangements in more detail. Builders are also recognizing the trend and some are specifically providing multi-generational housing options within their developments. Another popular concept related to multi-generational housing is the ability to “age in place”. This concept refers to the ability for someone to stay in the same community as they grow older, potentially moving into different types of housing as their lifestyle changes. For example, a family living in a single family home may downsize to a smaller home after the kids grow up and move out. The parents then may decide to move into a smaller unit with less maintenance or shared maintenance (such as a townhome or condominium). Then when the parents reach an older age, they may seek out some type of assisted living facility. The ability to “age in place” allows for that housing mobility to occur within the same neighborhood, so that people maintain access to their support systems and are able to continue to participate in activities within their neighborhood or community. Allowing a variety of housing options within a neighborhood can increase opportunities for multi-generational housing and aging in place. 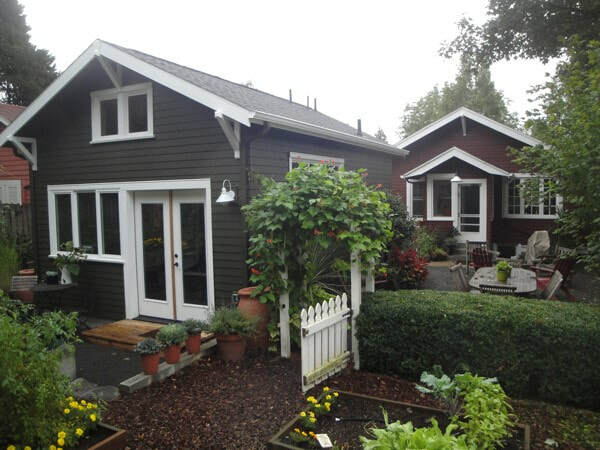 Housing variety and options could come in the form of accessory dwelling units on properties with single family homes, duplexes, or other types of infill, smaller-scale residential units in existing neighborhoods. Is this something that is important in a Great Neighborhood? What is environmental design or “green” building construction? There are a number of construction techniques and practices that could be considered “green” or environmentally friendly. Some of the more well-known green building practices that might come to mind are energy efficient appliances, green roofs (roofs covered in plant materials), or solar panels for providing electricity. However, there are a number of other, more subtle, green building practices that can be employed in individual building design, or even in larger development projects. Trees, when placed properly, can keep a home cool by blocking sunlight in the summer and letting more light in during the winter when leaves fall. Landscaping materials can be selected that are drought-resistant, reducing the need for water usage. Home sites can be designed and oriented in certain directions to harness passive solar energy. Retaining existing structures can be more environmentally friendly by reusing and conserving resources and materials. Stormwater bioswales were included in the reconstruction of Alpine Avenue, and you will also see bioswales along the newly reconstructed Hill Road, near the intersection of Hill Road and Baker Creek Road, when that street project is complete. Another new residential subdivision along Cumulus Avenue is also installing bioswales in the streets to treat stormwater run-off. Do you think that it is important that these types of environmental design or “green” construction techniques be used in our neighborhoods? To Art, or Not To Art? When you think of your favorite neighborhood, what is it that makes it specifically stand out as a great place? Most likely, that neighborhood has something unique about it that makes it stand out in your mind. A lot of the places that I think of have something in common – unique public art. McMinnville’s downtown area has some great examples. 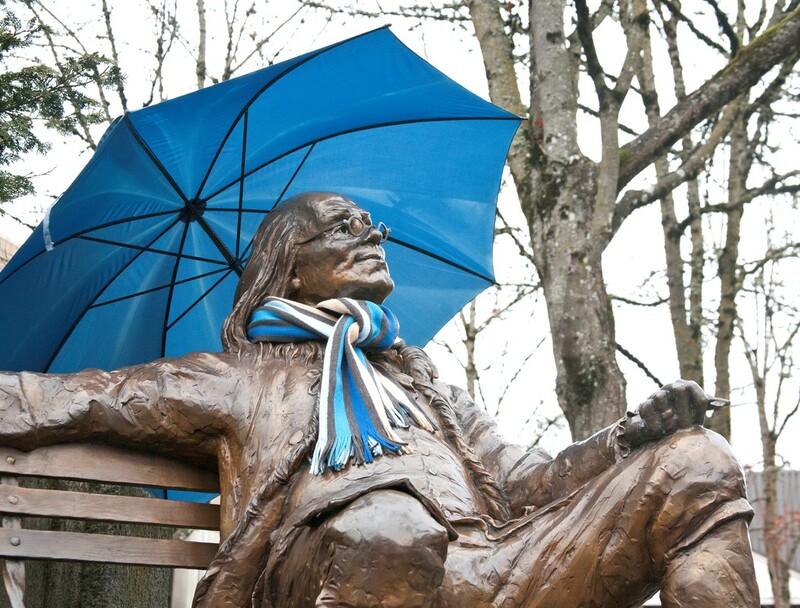 We have all probably sat down at least once by Ben Franklin or Abraham Lincoln, but there are many other installations around town (in case you haven’t found them all, this Oregon Art Beat segment from OPB shows a few more popular ones around town: https://www.pbs.org/video/oregon-art-beat-mcminnville-public-art/). Another one of my favorite public art examples comes from my hometown. 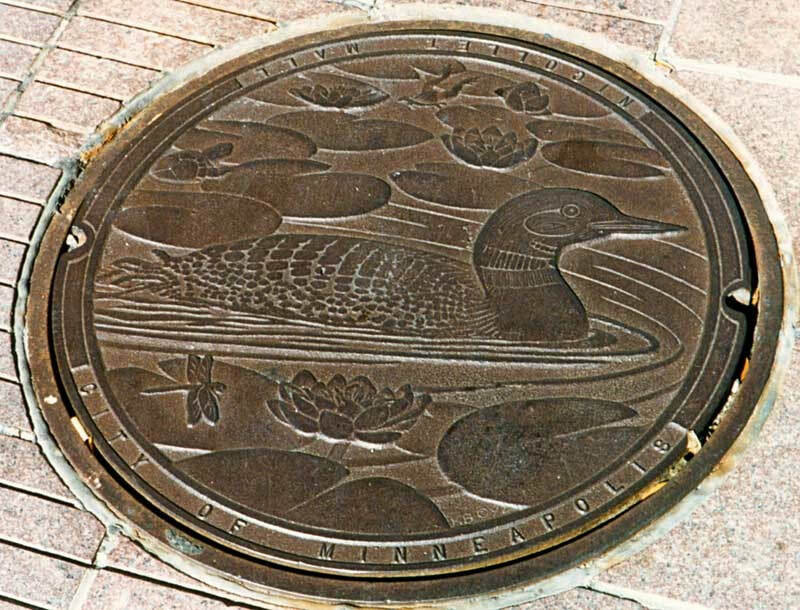 In Minneapolis, all of the sewer manhole covers on Nicollet Mall, a pedestrian-oriented street, are decorated with engravings of iconic things from Minnesota nature. One has a walleye (the state fish) and another has a loon (the state bird). These public art pieces are small in scale, but standout as you walk down the sidewalk. 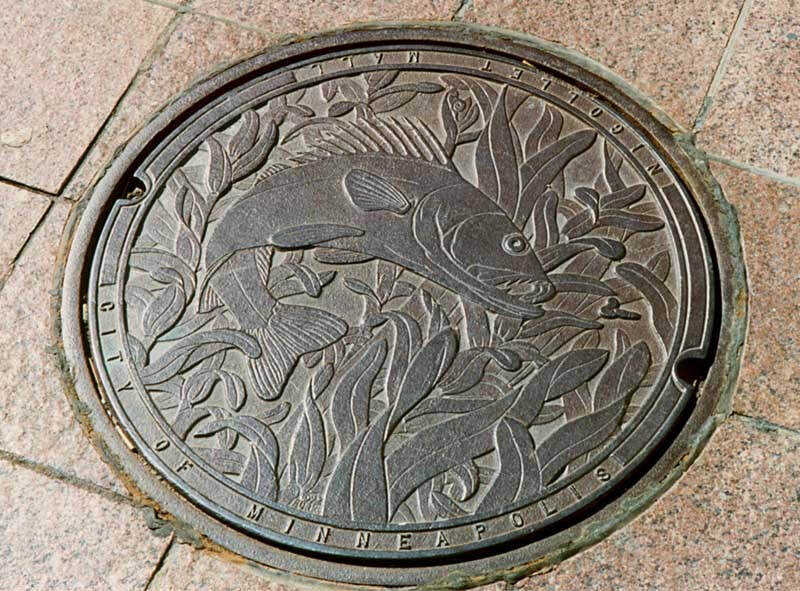 This form of public art comes from an idea of taking your normal infrastructure pieces that are required in any urban area (think utility boxes, streetlights, manhole covers, etc.) and turning them into an opportunity for public art. These small public art pieces, while somewhat minor, can spark a conversation, provide a good photo-opp, and overall help to contribute to the character of a place. Do you think that opportunities for public art is an important characteristic of a great neighborhood? McMinnville a great place to live, raise a family, and retire. How can we ensure that everyone lives in a great neighborhood and that we protect those elements of a neighborhood that make it great? 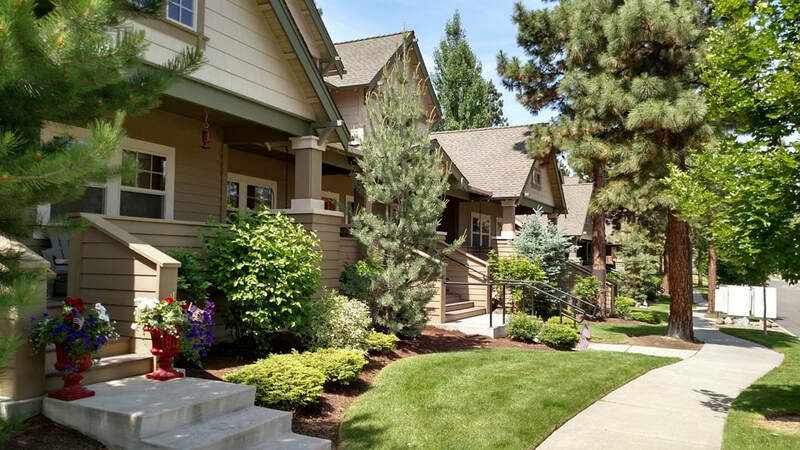 Each week we will explore a different planning principle on the blog and how it relates to creating great neighborhoods. The blogs will be accompanied by a two question survey about this principle, and answers will be used to help guide our future work in developing great neighborhoods in McMinnville.